Everyone has a story to tell. A moment to memorialize, such as a birth, death, big event, adoption, or vacation. Often, you hang onto an object to remind you of that time. A scrap of fabric from your grandmother's quilt. A piece of cement from the first home you purchased. A tattered, well-loved baby quilt. Sand from a memorable vacation. A ribbon from an award you earned. Have I got you thinking? Good! The idea of having a piece of jewelry to commemorate an event is not a new one. Wedding rings, mourning jewelry, military medals, class rings, Olympic medals. It’s common for us, as humans, to want to have a physical memento of a time or a person to hold onto. 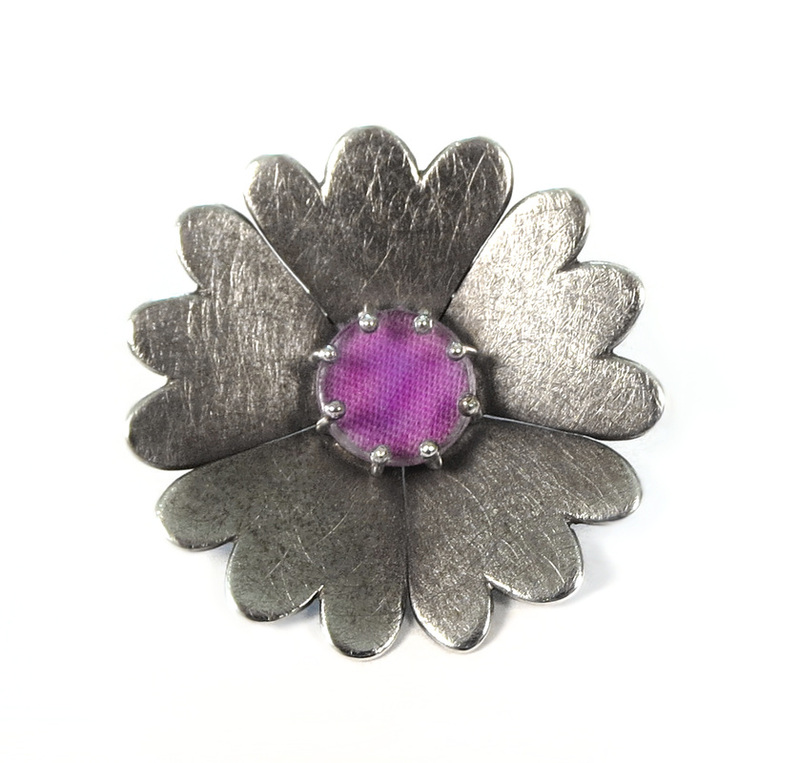 But, what if you could work with an independent artist to create a piece of jewelry that includes your specific object? That’s what I’m offering you. An opportunity to memorialize an important moment in your life — to tell your story — with a new family heirloom. Based on the object you want to include and the story behind it, I will work with you to design a custom "Turning Point" piece of jewelry. On this page, you'll see examples I've made, and can read the stories I've helped others tell. Contact me to discuss your idea and object. I custom-design each piece, so let's start telling your story! 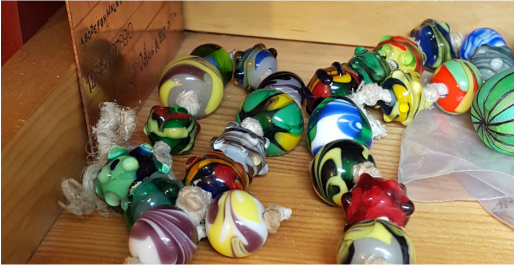 ​Tucked into a corner of my jeweler’s bench is a pile of beads strung on a hemp cord. 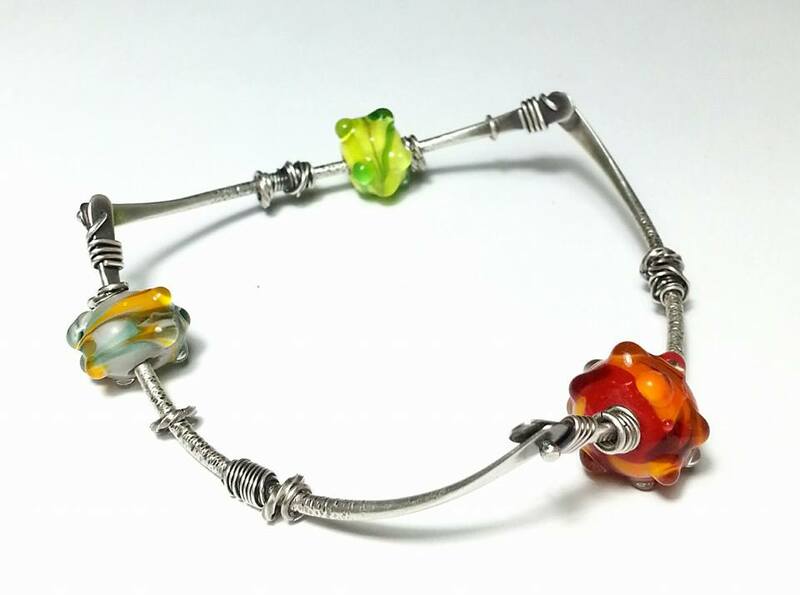 But, they’re not your run-of-the-mill lampworked beads. These particular beads were made by my younger brother, David (see my previous blog post). David died in 2013, and though I’m past my hemp-necklace-wearing days, I keep them on my bench. Yeah, they get in my way sometimes, but it’s important to me that they stay there where I can see them every day. ​It’s that desire to see them/him every day that led me to utilize them in a bracelet I could wear all day, every day, as a way to honor him and keep him with me. Thinking about how life can change in an instant, turning from a set path to an altogether different direction, I designed a bangle with multiple pivot points. These joins allow for movement and flexibility in the bracelet itself, but also serve the purpose of holding David’s beads securely on the segments. 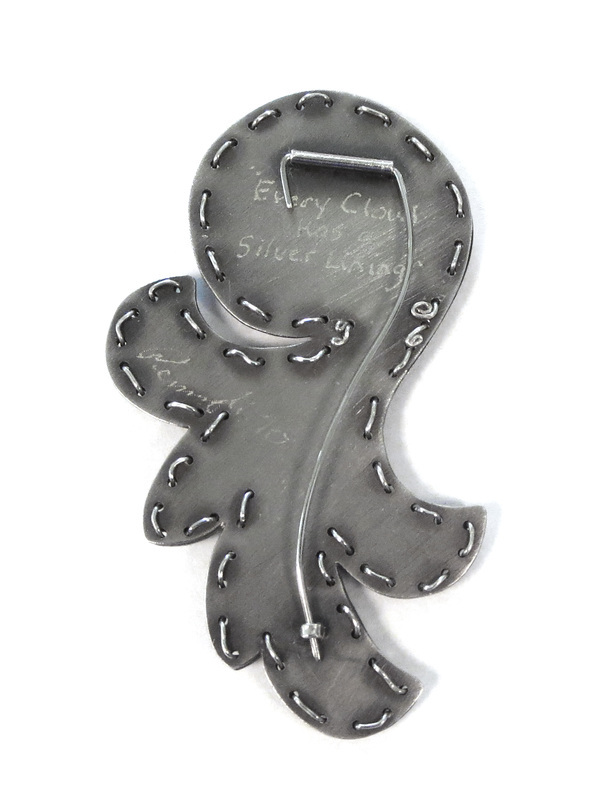 The flared ends of each segment lock the beads in place, never to let them (or him) go. I’ve made a number of variations of this style since then (get one for yourself here!) and they’re one of my best selling products. But, the one with David’s beads? That one’s mine. 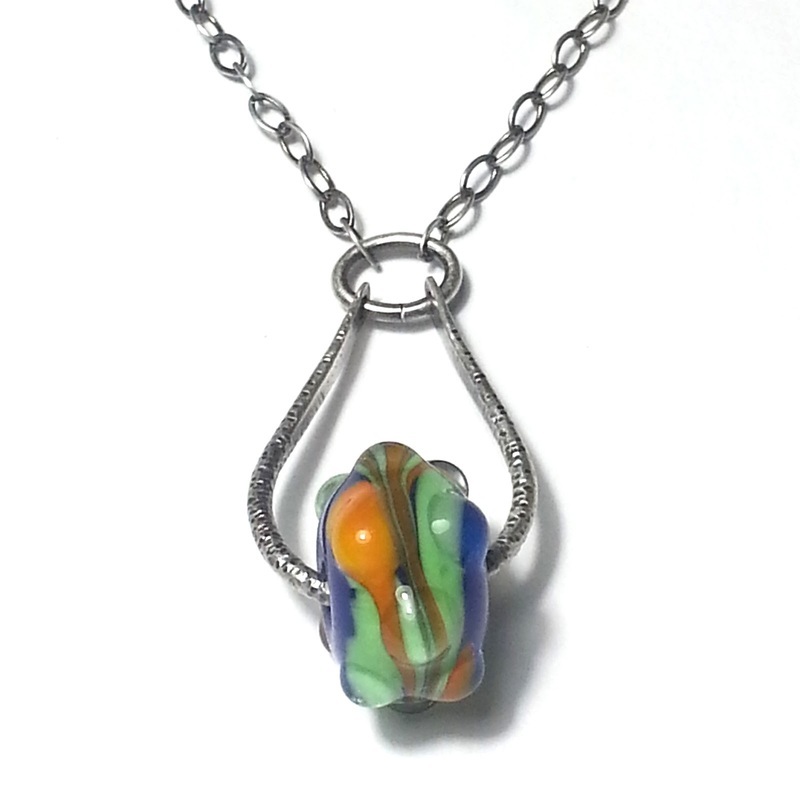 I made my mom a similar pendant using one of David’s beads. I like the simplicity of the design. A bead that, to the person out-of-the-know, is simply “pretty.” Suspended on a teardrop-shaped hand-formed and textured sterling silver wire, and topped with an oval bail. It means a lot, yet doesn’t scream out its hidden meaning. ​This is the story of three generations. 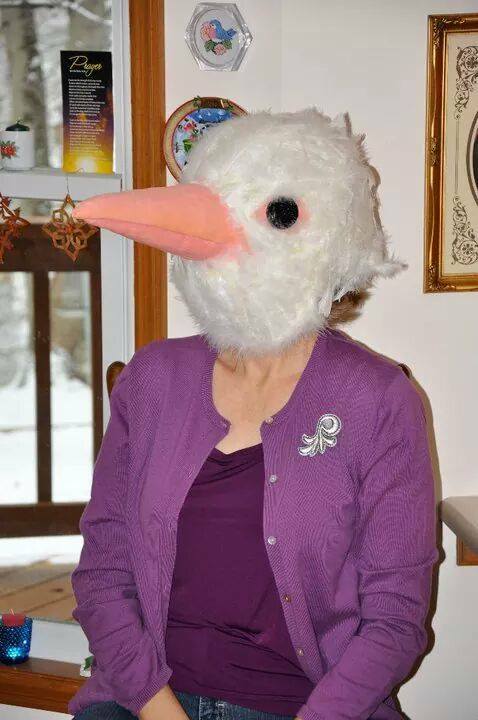 My mom, Susan Stewart, is an award-winning quilter (check out her website — you won’t be disappointed). 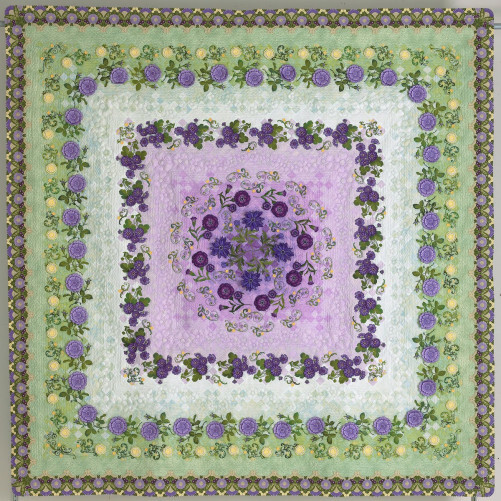 In 2009, she collaborated with her mom (my grandmother, and the quilt’s namesake) to create “Gloria’s Garden.” My grandmother chose the fabrics and pieced the top, and my mom did the embroidery and quilting (See at detail shot here). 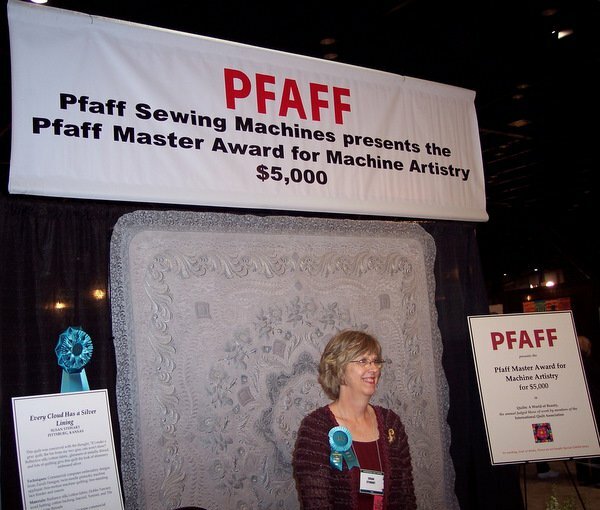 It won 1st place in Computer-Aided Machine Embroidery and the Houston International Quilt Festival in 2009, as well as the $12,000 Gammill Longarm Machine Workmanship award at the American Quilter’s Society Paducah 2010 show. That’s where I came in. 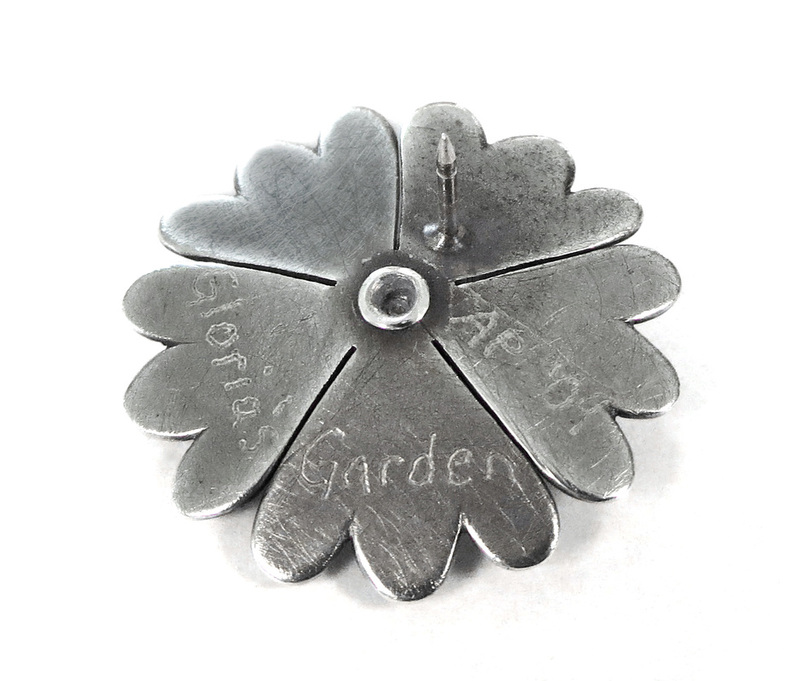 ​I created matching silver brooches for my mom and grandma based on the two, inter-generational components of the quilt. 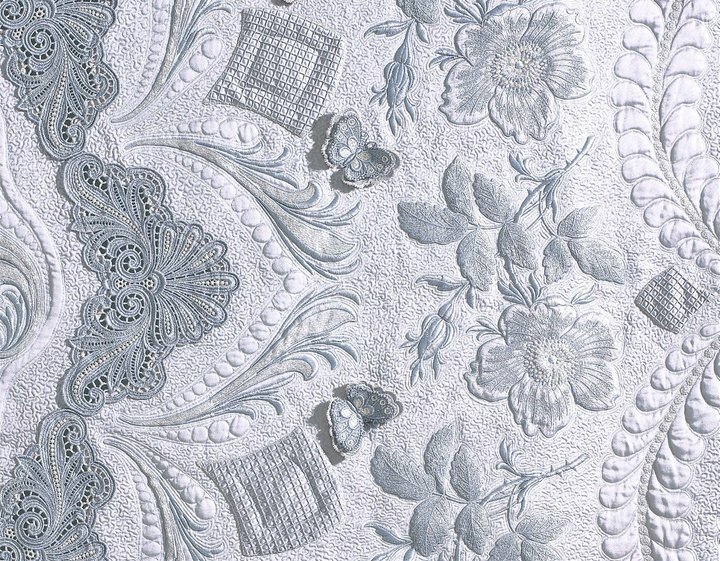 The shape of the sterling silver flower echoes the freestanding lace my mom made, as well as some of the quilted flowers. And, at the center, is a small piece of one of the fabrics my grandmother chose and used to piece the quilt. The fabric is sealed and is set with sterling silver prongs behind an acrylic sheet. I had so much fun working on the brooches, but the best part of it all? I was able to attend the award ceremony at the 2010 AQS show and surprise my grandma. My mom was in on it, but Nana and Paw didn't know I was coming. I presented them with the brooches, and then we went to the ceremony where they found out they won the big prize! 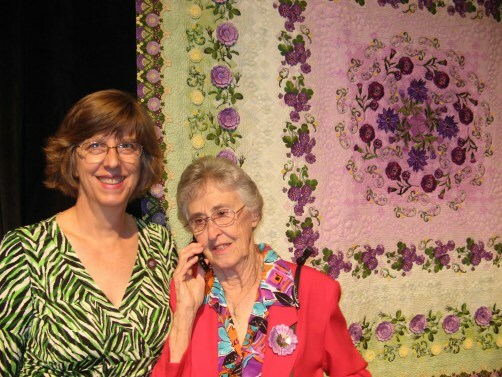 The photos below are of mom and Nana in front of their award-winning quilt. "Gloria's Garden" is now in the permanent collection of the National Quilt Museum in Paducah, KY, and was included in the Lark Books publication, 500 Traditional Quilts. In 2010, my mom made another award-winning quilt (it's a trend...) titled "Every Cloud Has a Silver Lining." It's made from a single piece of silk/cotton fabric, and embroidered in matching gray and metallic silver thread. She used approximately 47,000 yards of thread and nearly 5,000,000 embroidery stitches to complete the quilt! So, obviously, I needed to make her a matching brooch! Using the swirling embroidery designs as inspiration, I created a double-layer sterling silver brooch that's stitched together with silver wire. For the top layer, I used the techniques of chasing and repoussé to create form and volume reminiscent of the embroidery stitches. The bottom layer is engraved with the quilt name and signed and dated. 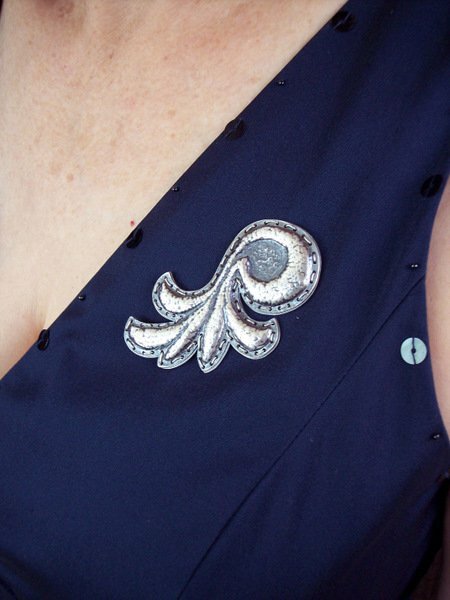 The pin stem echoes the curving shape of the brooch, making it an integral part of the design, and not an afterthought. 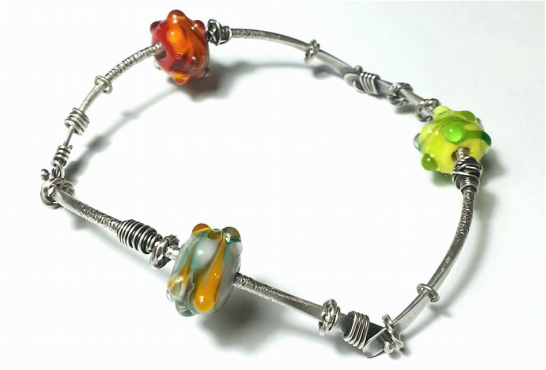 In April 2015, I was commissioned to design a "rock-n-roll" bracelet as a birthday gift for the prolific, supremely talented, Milwaukee-area musician, Gabriel Sanchez. 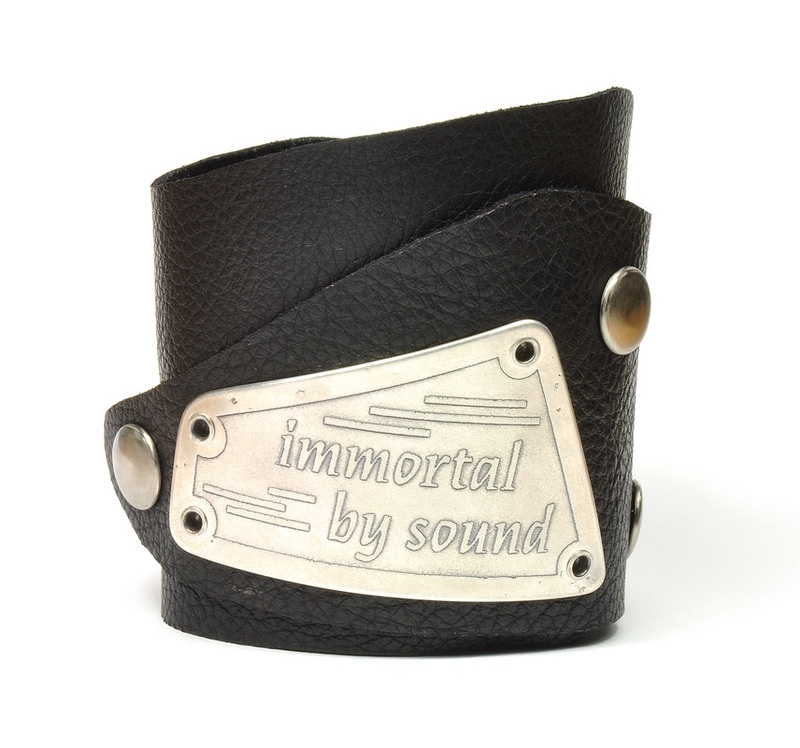 The bracelet was designed in advance of his first solo cd release, "Immortal By Sound." Read more about this project here.